Trilogy Excursions, based on Maui, is offering a 50 percent discount on all ocean sailing adventures to residents statewide through Dec. 15. Nonresident family and friends traveling with kamaaina will receive 25 percent off excursions that residents book. With the discount, the $179 Discover Lanai trip will be reduced to $89.50 for kamaaina and $134.25 for a nonresident guest. A $110 Discover Molokini or Discover Kaanapali trip will be $55 and $82.50, respectively. The prices above do not include tax. To make a reservation, call 808-661-4743. 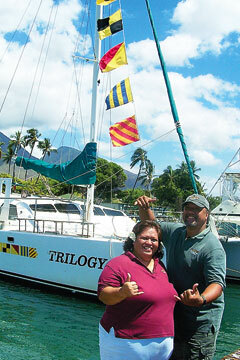 For a menu of trips, visit www.sailtrilogy.com or call toll-free 888-225-MAUI. Sister and brother Donora and Willie K Kahaialii show their support for Trilogy's kamaaina promotion. To introduce its newly renovated rooms this fall, the Ala Moana Hotel will be offering special rates from $129 per room per night in its Waikiki Tower, overlooking Ala Moana Beach Park with panoramic views of the Pacific Ocean. The rate, exclusive of taxes, is valid through Dec. 21. The hotel, at 410 Atkinson Drive, just finished a multimillion-dollar transformation to update its island-style appeal. The hotel is less than a mile from Waikiki and steps away from Ala Moana Center, Ala Moana Beach Park and the Hawai'i Convention Center. For reservations or information, visit www.alamoanahotel.com or call toll-free 800-367-6025 within the United States, Canada, Guam and Saipan. In Hawaii, call toll-free 800-446-8990 or direct at 955-4811. Duke's Waikiki is located beachside in the Outrigger Waikiki Hotel, 2335 Kalakaua Ave. Validated parking is available at Ohana East Hotel, 2375 Kuhio Ave. For reservations or more information, call 922-2268.